Join Minna, Pip, Mom, and Dad on a visit to Butterfly Place as they meet Bert the Butterfly Man. They hunt for monarch butterfly eggs and caterpillars, and see the amazing change from pupa to adult monarch butterfly. They learn all about monarchs, metamorphosis, and monarch migration. 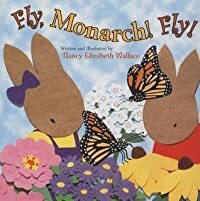 Nancy Elizabeth Wallace’s sunny cut-paper artwork and lively text entertain as they teach about one of nature’s most remarkable creatures.